Jenna Welch Bush, the younger of twin daughters born to President and Mrs. George W. Bush, married Henry Chase Hager on May 10, 2008 at the Prairie Chapel Ranch near Crawford, Texas. Jenna, a published author, now works as a teacher's aide and a correspondent for The Today Show on NBC television. It was just another December day at the office in 2007 when Mary Jane Ontiveroz got a phone call from a stranger, asking about a Tres Leches wedding cake for the weekend of May 10, 2008. The voice on the other end of the line referred to a wedding in San Antonio the previous May. Her friend had attended that event, she said, and raved about the cake. 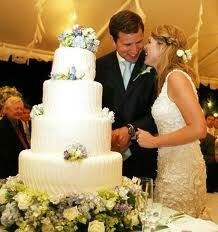 In fact, she liked it so much she asked the bride who had made her wedding cake. “The Ultimate Cheesecake Bakery in San Antonio” the bride had announced. “Well,” Mary Jane said, “Let me talk it over with my husband and see if we can feasibly do that.” If she was going to keep up with orders, they would have to figure the logistics on making the delivery for this one. Tom Ontiveroz gave his okay, and the first round of negotiations was concluded. In subsequent calls, Mary Jane was given the impression that she would be preparing the cake for a young couple named Lindsay and Tim and that it would be delivered to a ranch outside Waco. At other times she surmised that the lady who was planning the wedding was the bride’s mother. She was asked to prepare a sample of the Tres Leches cake for pick up in the Dallas area. She made the cake and had the local Dallas area Ultimate Cheesecake distributor deliver it. No flags went up, just business as usual. Mary Jane was always trying to figure out how she could get everything finished, out the door, and actually delivered on time. The latter part of the process is sometimes the most difficult task. She had recently booked a wedding cake order for delivery to the Canyon Lake area, several hours drive away. She arranged for the Canyon Lake delivery to be made by her assistant, Anna. A couple weeks after that order had been placed she received a surprise visit from the Canyon Lake client, who had driven over to cancel the order in person. There was a friend with a closer bakery, the bride apologized. That evening, Mary Jane sat down and wept with exhaustion. It was tough work, trying to survive in a small business. But she thought that maybe that cancellation was a good thing, because now she wouldn’t have to worry about that cake order and another delivery. Mary Jane was speechless. A wave of emotions swept through her. She had fantasized many times of just such a moment, preparing a cake for a celebrity wedding, but it had never entered her mind that it could be possible. Her sample cake in February had been a big hit, she was told. The cake was delivered to Dallas and used for a dinner hosted by the Bush family for foreign dignitaries, who enjoyed it as part of their dessert. That night, Mary Jane couldn’t sleep. She tried. All night long she tossed and turned. Step by step, she went over the cake-making process, the delivery, and the other orders looming over her, and was overwhelmed by all that could go wrong. She didn’t tell Tom until the next morning. At least one of them would get some sleep. Geraldo on the Jenna Bush wedding and the war.